After Pennsylvania Governor Tom Corbett proposed a 53 percent cut to the state’s 2011-2012 higher education budget, Millersville University President Francine McNairy sent an urgent campus-wide email. 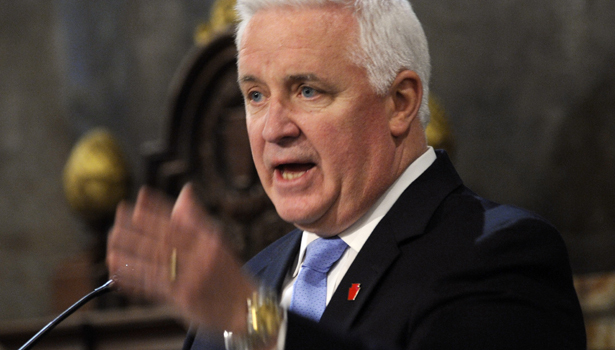 Corbett’s “massive cuts are upsetting,” she wrote on March 8, 2011. “We at Millersville are encouraging our students and their families, our faculty, staff and alumni to contact their local legislators and urge them to advocate on behalf of public higher education in Pennsylvania.” On March 28, the men’s cross country team ran a 40-mile relay from Millersville to the state capitol, where they met up with thousands of students and workers from across the state for “United We Stand, Underfunded We Fail.” Three months later, the Republican state legislature lowered a smaller axe—18 percent. Still, this would cost Millersville $6.34 million, including, despite their triumphant, crowd-parting display, all three men’s track teams. Naturally, then, the man Millersville has chosen to usher graduating seniors into the world of debt and unemployment is the same one who rules it: Tom Corbett. An opportunity, indeed—for people like Jerry Eckert. In the weeds of Corbett’s selection are hints of old-boy patronage, a business decision based on shifty insider trading. Two figures stand out. The first is Eckert, Millersville’s Vice President for Advancement—and an appointed member of Governor Corbett’s higher education committee. The second is Kevin Harley, a 1986 Millersville grad who doubles as a member of the Millersville University Council of Trustees and Corbett’s sitting press secretary. With these gubernatorial ties, the logic of Millersville’s “demonstration” works both ways. For someone whose infamy stems from the unpopularity of his budgetary decisions, Corbett’s selection gives him the opportunity to enter the politically no-frills space of a graduation ceremony and trumpet his abstract devotion to the state’s shrinking education system. If Corbett’s selection is an under-the-table political play, Millersville has followed in step—violating its own bylaws in the process. For the commencement committee that Eckert chairs, which comprises students, faculty and administrators, “The terms of office begin 1 October, and the committee shall meet at least one time per year, usually during the fall semester, but at other times at the call of the convener or a majority of the members of the committee.” But according to university spokesperson Janet Kacskos, “They haven’t met in the last couple years.” Millersville has “a standing list of folks we’d like to speak at commencement,” she told The Nation, and as sitting governor, Corbett’s appearance is significant. For faculty and students, the university’s apologies are stacking up. At Millersville—and universities the world over—command-and-control governance is part-and-parcel of unforgiving budget politics. Over spring break, the university bulldozed “the Bush,” a patch of forest on campus used for biology research, to make way for a new student housing project. The Friday before the break, all faculty members were emailed about the move—far too late for any to speak up. In November, Millersville’s Council of Trustees overruled the school’s Presidential Search Committee in nominating a slate of potential new presidents for the state to choose from—a possible violation of Pennsylvania Act 188. “It has become a slippery slope of people being disenfranchised,” says Jill Craven, a Millersville English professor. “There’s an old boys network that works in a particular way. It’s another thing when administrators want to take advantage of that.” Faculty have also felt the blunter edge of the Corbett axe. In March, the union representing the fourteen schools in the Pennsylvania State System of Higher Education (PASSHE) settled contract negotiations with the state—after nearly two years of negotiations and a November vote authorizing a strike. What to do about Corbett at commencement? When the governor spoke at Albright College in 2011, the faculty voted unanimously not to grant him an honorary degree—despite that Albright is a private school that’s off the governor’s operating table. At Millersville, the top-down governance that set the stage for Corbett’s selection has lit a fire under campus dissenters. Come commencement, students and allies plan to stand silently and turn their backs on the governor when he speaks. “He turned his back on us, so we’re going to turn our backs on him, and show him what it feels like in public,” Mertz says. In the neoliberal university, speech may be free, but it’s also profitable. At a commencement ceremony, speakers have an ideal opportunity to make bank. With no room for rebuttal, counter-speech must be off the premises (as with “alternative commencement” ceremonies) or a silent jam. Score one for Tom Corbett. But score another for the forces of popular resentment—who, at an event where imagery trumps debate, don’t seem willing to give the governor’s image back. For first-person takes on student uprising across the country, read StudentNation's Dispatches From the US Student Movement.